• Limited edition in A5 digibook with extra part in the booklet telling the history of Edguy. • Produced, mixed and mastered at Gate Studios, Wolfsburg, Germany. • Track 13 is a limited edition bonus track. Edguy's problem remains the same: Tobias Sammet writes a couple of strong songs, and the rest of the disk space is taken by the worse material. It was on the previous disc "Hellfire Club", and it is happened with "Rocket Ride". So it turns out that the excellent things like "Matrix" and "Superheroes" are coexist with a boring happy-power. Fortunately, this time there is not so much. 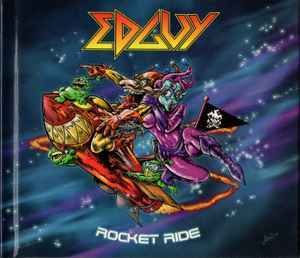 The album turned out mostly mid-tempo, Edguy sometimes sounds like old-school hard rock band.